Emanuele Bernardini was elected via by-election on the 18th August 2017. For information on how to contact individual councillors, please contact KTC at the address below or call 01535 618252. Read about the East Morton book exchange, Yorkshire in Bloom judging and the Friends of Westfell clean up day. We look forward to Remembrance Day and Christmas in Keighley. Take a look at what Keighley Town Council has been spending its money on this year. What a day we had in Keighley on August 1 celebrating Yorkshire Day. All the latest community news including East Morton’s new shop and how we’ve been recognising our young achievers. Front page photo taken by Safia Kauser Information correct at time of going to press. May be subject to change. All rights reserved and is the property of the publisher. © Keighley Town Council 2017. Reprinting any part or matter appearing in KTC Connect is strictly forbidden except by permission of the publisher. All copyright of images/content remains that of its photographer/author. 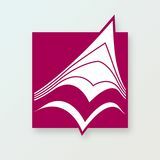 Every effort has been made to gain permission to publish copyright material however, where efforts have been exhausted, we have published on the basis of ‘Fair Use’ to comment factual based material where by its use is not central or plays a significant part to the entire publication but to act as an aid for historical and educational purposes only. This publication is offered as a limited print run. The publisher makes every effort to ensure that the magazine’s contents are correct. However, it cannot take responsibility for any effects from errors or omissions. Keighley Town Council does not accept any responsibility or liability for any of the services or products provided by the advertisers. ST GEORGE'S DAY There were festivities, food and fun on the weekend of St George’s Day in April. Yorkshire in Bloom judges Phil Young and Beatrice Myers visited Keighley this summer to take a look at the flowers in the Town Hall Square. It’s the first time the square has been individually entered into the Yorkshire in Bloom competition, although the square has always been judged as part of the overall entry in previous years. Judges met Keighley Town Council contractor Steve Thorpe who has been working all year round to make sure the flowers look their best. Members of Keighley town Council later took judges on a tour of the town, following a route put together by Keighley in Bloom organisers. As reported in the last KTC Connect newsletter, work is being undertaken by Bradford Council, Keighley Town Council and local community groups to develop an emergency and flood plan which will outline what action to take in the event of an emergency such as flooding. Discussions are being held regarding the purchase and storage of emergency equipment such as radios and sandbags and the plan has been updated with all the town councillor contact details for each ward they cover. Councillor Peter Corkindale has replaced former councillor Ian Dermondy and will be working with officers at Bradford Council to develop the plan and further updates will be reported in the next issue of the newsletter. Keighley Town Council held a civic reception for members of the team that took part in the National Special Olympics in Sheffield on Thursday August 24. Held at the Civic Centre, the event was organised to celebrate the athletes’ achievements after the team won 51 medals including 12 gold and 17 silver. The team was made up of 60 athletes and coaches from Bradford who formed part of the Yorkshire and Humberside squad and competed at the 2017 Special Olympics National Summer Games in Sheffield. 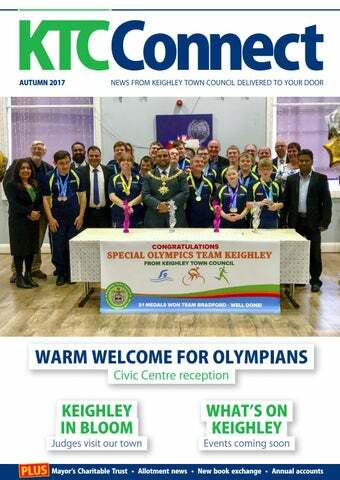 Town Mayor Mohammed Nazam said: “It was a delight to host the reception for our Special Olympic athletes from the Keighley area who have made the town proud. I’d also like to thank everyone who helped raise the funds needed to assist people to take part and those who volunteered to help out at the event.” Bradford Disability Sport and Leisure (BDSL) raised more than £25,000 to help send the team to the games. Dean Carroll, BDSL Manager, said: “All the athletes from the Bradford delegation represented their region and the city of Bradford with pride. The atmosphere at the games, from the wet but marvellous opening ceremony to the closing party disco, was out of this world and something we will never forget. The athletes showed us all what it’s possible to achieve with a little hard work and dedication.” Meanwhile, Keighley’s former Town Mayor Cllr Shabir Ahmed presented BDSL’s Special Olympics Team with a cheque of £2,315.84 raised during his mayoral term from 2016 to 2017, which has already helped to pay for some of the costs associated with sending the athletes to the National Summer Games in August. The team is now looking forward to March 2019 where they hope to be part of the Special Olympic GB Squad competing in the World Special Olympic games in Abu Dhabi, United Emirates. After the recent public consultation was carried out to determine the future of the Keighley Civic Centre, full council was asked in May this year to consider a retaining options appraisal document and a business plan and exit strategy. Both documents were put forward by the Civic Centre and Strategy Committee for full council consideration. Business Plan & Exit Strategy This document contained two recommendations: 1. T  o place the Civic Centre on the market for sale 2. Secure short-term occupiers to relieve financial pressure on the operational budget These options and recommendations have been discussed at great length by members and consideration has also been given to third parties who may be interested in managing or leasing the Civic Centre. The council concluded that recommendation one is implemented ‘To continue and expand discussions with third parties about managing or leasing the Civic Centre’ with a timescale of 31 December 2017 for discussions to cease. if it isn't resolved by this date, the council has recommended that the Business Plan and Exit Strategy should be reconsidered in the new year. The council also agreed a strategy for the interim period to secure short-term office occupiers to relieve financial pressure on the operational budget. Discussions are currently ongoing with third parties about managing or leasing the Civic Centre. One of the parties includes the police, who are currently looking to move out of their premises in Airedale House and relocate to a town centre location. A meeting took place with the Police and Crime Commissioner Mark Burns-Williamson and senior officers from West Yorkshire Police and a subsequent estates visit was carried out in August. The council is currently waiting for further updates on this matter. Any interested parties who wish to manage or lease the Keighley Civic Centre building on a long-term agreement should contact Rob Wadsworth on 0115 855 9983 or 07534 969154. MP for the Keighley and Ilkley constituency, John Grogan, who was recently elected in the June parliamentary elections, has moved into his new office at the Civic Centre. Commenting on his recent electoral success, Mr Grogan said: “I would like to thank the people of this constituency for electing me. I look forward to representing the area over the term of this parliament – however long that may be. If you have any issues you would like to bring to my attention, please don’t hesitate to get in touch. I am holding regular surgeries in Keighley. Please ring the office to arrange an appointment.” You can contact Mr Grogan by emailing john.grogan.mp@parliament. uk or by calling 01535 681433. His address is: Keighley Civic Centre, North Street, Keighley, BD21 3RZ. Question: Tell me about your background… Khalid Khan: I’ve been a police officer for 26 years. I first got promoted to sergeant in 2002 and I worked in Keighley for two years as a response sergeant and custody sergeant before moving to Shipley. I was promoted to inspector in September last year and have been in my current post for a year. Question: What major changes have you noticed taking place during your career? Khalid Khan: Keighley was a fully operational division known as Airedale and North Bradford, however over time we became one big district. Previously, neighbourhood policing was at its peak thanks to an increased number of officers and Police Community Support Officers (PCSOs). However, when austerity measures kicked in some very difficult decisions had to be made as the force had to carry out millions of pounds worth of cutbacks. This had a huge impact, but over the last 12 months we’ve started to develop neighbourhood policing again with ward officer teams working alongside PCSOs and our partners. Police numbers aren’t at their previous level but we are moving in the right direction. Question: As an officer from a minority background, would you like to see more officers from a Black and Minority Ethnic (BME) background in the force? Khalid Khan: Our force is making a great effort to ensure we have BME representation to match our local demographic. A positive recruitment campaign has been running for the last two years to encourage fairer representation from ethnic communities. Question: I’ve head that your style of policing is different from previous inspectors? Khalid Khan: My background is in neighbourhood policing and I am very keen to ensure that I can build positive relations with both the public and our partners. My aim is to engage with our communities and work with our partners to build trust and instill confidence in our communities. We have set up street surgeries in each of our six wards to show that we are listening and engaging with our communities and we work closely with Bradford Council, youth services and local councillors, acting upon any concerns raised. We often work with local schools to ensure our youth are not led down the wrong path, attend community events and meetings to build relationships and proactively target criminality to ensure our communities are safe. Question: If you could give a message to the public, what would it be? Khalid Khan: We are listening to you, our priorities are to tackle criminality head on with the issues that you have raised. We have set up Operations to deal with drug crime to ensure our streets are clean, bad driving to ensure our roads are safe, Proactive CSE operations to ensure our children are safe and targeting criminals to ensure our homes are safe. Our Street Surgeries are a means of talking and listening to you and putting actions in place with our partners that are effecting our communities. www.kafa.org.uk or Facebook page @ KeighleyArmedForcesAssociation. We could always do with more volunteers." Visitors were able to watch a Spitfire fighter fly past, cavalry and Second World War home guard re-enactments and enjoy a mini funfair, refreshments and live music. Keighley Town Council will continue to support Armed Forces Day with a contribution of £2,500 for the next two years. £12,095 has been given in funding through the Acorn and Oak Grant schemes to local schools, clubs and voluntary organisations throughout the parish. We've also awarded £5,968 to Friends of Holden Park, £4,510 to Burgess Field, £6,761 to East Morton Community Shop, £10,000 to the Highfield Community Association, £1,000 to Community Cougars Foundation, £1,000 to the Friends of Eastwood PTA, £1,000 to Keighley Festival, £1,000 to Friends of Holden Park and £1,000 to Residents of Grouse Street and £250 annual funding to support Christmas Day free bus service. Ey up – what a day! eighley Town Council hosted a day of family fun to celebrate Yorkshire Day on Tuesday August 1 this year. The Town Mayor of Keighley, Councillor Mohammed Nazam, opened the event at 10:00am with a ribbon cutting. Residents and visitors alike were welcome to attend and to have their photographs taken with the Mayor. Despite the typical Yorkshire weather (including a mid-afternoon thunder storm!) the fun continued until 4:00pm, with free entry and free amusements all day. Two face painters were on hand helping to transform the looks of younger visitors. In addition, there was an opportunity to get up close and personal with the ferrets of the Worth Valley Ferret Welfare charity. Sticking with the Yorkshire theme, Yorkshire flat caps manufactured locally were on sale (the Mayor is pictured on the right wearing an example!) along with Yorkshire Dales ice cream. Other attractions included a bouncy castle, balloon modellers, a penalty shootout and a bungee trampoline. Early birds received white roses to take home as souvenirs from the day. The Chairman of Keighley Town Council’s Events and Leisure Committee, Councillor Luke Maunsell, said: “We took great pride in celebrating our county and our town on the first day of August. I would like to extend my thanks to everyone who helped make the day possible”. “We took great pride in celebrating our county and our town on the first day of August. I would like to extend my thanks to everyone who helped to make the day possible,” said Cllr Luke Maunsell. Garden of Remembrance and Remembrance Day The Garden of Remembrance service will take place as usual in the Town Hall Square at 10:55am followed by a two-minute silence at 11:00am on Thursday November 9 2017. Remembrance Day will take place on Sunday November 12 and the parade will start from Russell Street at 9:30am before the service commences at Keighley Shared Church at 10:00am. Town Mayor Mohammed Nazam and Mayoress Shamim Akhtar will attend the service at Keighley Shared Church, which will be followed by a two-minute silence and laying of wreaths at the Town Hall Square War Memorial at 11:00am. Following the service, members of the parade will march down North Street before congregating at the Town Hall Square for 11:00am Representatives of public bodies and voluntary organisations, who wish to accompany the Town Mayor and Mayoress to the church, should meet at Russell Street no later than 9:10am and follow instructions from the Parade Marshall. Order of service booklets will be available from Reverend Jonathon Pritchard of Keighley Shared Church or the Town Council office from November 6. Veterans are invited to Drill Hall for lunch and refreshments, however entry will be granted on a ticket basis only. Tickets can be obtained from the Civic Centre, please contact the Town Clerk for further information on 01535 618252 or call councillor Andrea Walker on 07476 85424. Keighley residents aged over 65 are invited to the annual Christmas Pensioners Lunch, which will run across two days on Tuesday December 12 and 13. The three-course meal will be followed by local schools singing in the Christmas choir as well as other festive fun. This social event is only available to Keighley residents and you will be asked for proof of residency and identity when requesting tickets. There are 100 places available and tickets can be obtained from the Town Clerk’s office on 01535 618252 or the Civic Centre on Mondays, Wednesdays or Thursdays between 1pm and 3pm. •	Do you want to know what your Town Council is doing? •	Have you got any questions or suggestions? •	Are there any local issues which are causing you concern? •	You will have the opportunity to quiz your Town Councillors on any concerns or queries you have on the future of Keighley Light refreshments will be provided. Primary schoolchildren have been presented with trophies for their outstanding effort, achievement and behaviour at the annual Keighley School Achiever Awards. The new mayor of Keighley, Councillor Mohammed Nazam addressed a packed council chamber during the 2017 awards, which were voted for by headteachers who were invited to nominate pupils who they thought deserved special recognition. Each child received a personal shield to take home and had their names inscribed on the school shield, which has the names of the award winners going back several years. Pupils were shown historic artefacts and award winners were given the opportunity to introduce themselves in the Council Chamber using the microphones just like a council meeting. Speaking at the event, councillor Mr Nazam said: “it was a great pleasure to meet the pupils, parents and staff from our local schools. The pupils’ engagement with the ceremony was superb and I hope it is something they will remember with pride”. You may remember that we reported in the last newsletter that the service for Canadian airmen was held in January 2017 to commemorate the lives of the six men who lost their lives. For readers’ information, the memorial stone in Tewitt Hill at Oakworth is the site where the Wellington Bomber crash landed in bad weather, fog and low cloud on January 2, 1944 which is why we have built a memorial stone at that location. £5,180 grant to save Holden Hall Holden Hall is one of seven community halls in the Bradford district under threat from closure due to Bradford Metropolitan District Council (BMDC) budget cuts. The Oakworth Community Trust has been set up to secure the future of Oakworth Village Hall (Holden Hall) and has applied to take on the operational responsibilities of the hall from BMDC through a Community Asset Transfer (CAT). It is hoped that a long-term lease will be agreed through this process which will permit the Trust to plan better facilities for hall users. The Trust’s primary objective is to complete the CAT process and run Oakworth Village Hall. To enable this, funds have been raised to pay for professional services needed to complete the CAT and also to establish a birthday party service provided by the Trust to generate additional income. A grant of £5,180 from Keighley Town Council was awarded on this basis and is key to completing the CAT and ensuring the Trust is on a sound financial footing for the future. The Trust has a secondary objective to help maintain and build on the sense of community in Oakworth and it has reached out to other local organisations to build relationships and strengthen local involvement. In conjunction with the Oakworth Scout Group, the Trust organised a Great Get Together event in the village and a Halloween event is also being planned with the Friends of Holden Park. here were festivities, food and fun on the weekend of St George’s Day, April 22 and 23 2017. With support from Keighley Town Council, Bradford Council hosted a special three-day outdoor market on Low Street, outside the Market Hall, opening on Thursday April 20 and closing at the end of Saturday afternoon. Meanwhile, on the Saturday, Keighley Town Council provided free children’s and street entertainment at nearby Church Green. The weather was kind and many people enjoyed the day. The former Deputy Town Mayor of Keighley, Councillor Barry Thorne, opened the children’s and street entertainment on Church Green at 10am. Two large inflatables kept the children busy, while giant board games, face painting and a range of hot and cold food also proved popular, together with music from a medieval piper. On Sunday April 23, Keighley Scouts held its annual St George’s parade and service, attended by the former Town Mayor, Councillor Shabir Ahmed, who took the salute with the District Commissioner. The Town Council, working with Bradford Council, erected banners celebrating the scouting movement, which were displayed from the lamp columns on Cavendish Street. Banners featuring the cross of St George were similarly erected in North Street. o mark Heritage Day 2017, two important public buildings, the Civic Centre on North Street and the Town Hall on Bow Street, were opened to residents and visitors by Keighley Town Council. The special openings on Saturday September 9 ran alongside other similar events in the town, including events at Cliffe Castle, East Riddlesden Hall and the museums of the Keighley and Worth Valley Railway, which were all opened as part of the National Heritage Open Days. Keighley Library was also opened to host an exhibition all about the history of music in the town. During the morning, illustrated talks and guided tours were held in the Civic Centre, which was originally the town’s courthouse and “lock-up” and later expanded to include a superintendent’s house and police station. An insight into the development of policing in the town was provided by former police officer, Councillor Peter Corkindale, who conducted tours of the former cells complete with police equipment uniforms and other memorabilia. On the afternoon, visitors were also greeted by Town Mayor, Councillor Mohammed Nazam who welcomed residents into the Council Chamber at Keighley Town Hall. Visitors were able to appreciate the large collections of paintings and photographs of past majors and dignitaries which adorn the walls.